I have personally used several products over the years that claim to invigorate your roots growth. Since starting out growing in 2004 I have grown several Hundreds of Thousands of plants of several differing species, each one I have found interesting as well as rewarding to grow. Whether starting from seed or from plugs (rooted cutting's) you need to understand that a plant needs roots. Your plants overall health almost always coincides with a healthy root system. I often can be heard saying that one needs to concentrate on growing roots, the more roots, better said, the more healthy roots, a plant has the more lush, vibrant and better producing a plant will be. Our store motto is, "Our Roots Support a Community". The majority of the nutrition your plants consume will come to it via the root system. So the more roots you have the more plant that can be supported above. The root system works in conjunction with many other components of the soil, these we will discuss later. 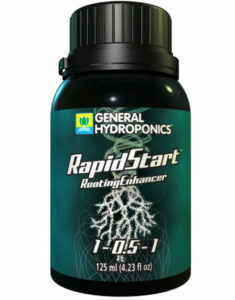 Today I will only be speaking about General Hydroponics root enhancer RapidStart. RapidStart wasn't the first root enhancer on the market in fact it was a bit late in hitting the market. What Rapid Start did do for the market was to bring a quality root enhancer to the grower that didn't cost an arm or leg to apply to your grow. Using my personal grow as an experiment most all of the products discussed here will have been tried in my own garden. I found Rapid Start to be extremely effective in providing a plant with a boost of root growth, the product works as General Hydroponics claims it does." RapidStart enhances your growing experience by delivering a powerful blend of premium plant extracts, amino acids, and nutrients generating explosive root growth. Using RapidStart stimulates prolific root branching and development of fine root hairs that increase nutrient uptake and grow healthier, whiter roots. Using RapidStart will make your plants explode! Use during the entire growing cycle in all types of growing media, including coco. RapidStart, strong finish; bigger is always better!" There are other root enhancers on the market but I have yet to find one that works this well for the cost.